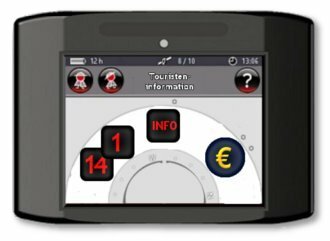 The media tour guide is a handheld, practical and modern version of an information system. Professional sound recordings, images and maps provide tourists and travelers from home and abroad with precisely the information they want - when and where they want it. The digital sound offers not only high, but even with constant use a consistent, premium sound quality. The media tour guide is compact, lightweight, easy to use and available in different languages. Because of its small size it easily fits in a pocket, pants, hand, or even a belt pouch.